The 53-year-old woman died in a car bombing on Monday. MALTA’S GOVERNMENT HAS offered a one-million euro reward for information to help solve the murder of journalist and anti-corruption campaigner Daphne Caruana Galizia. Announcing the move, the government also promised to protect anyone who came forward, following the death of the 53-year-old in a car bombing on Monday. Caruana Galizia, whose blog shone a light into the murky corners of Maltese politics, had regularly rattled the island’s powerbrokers, making allegations of financial corruption against Prime Minister Joseph Muscat’s inner circle, largely based on the Panama Papers leak. The government, in a statement, said it was “fully committed to solving the murder” and to “bringing those responsible to justice”. The money would go to “whoever comes forward with information” and that person “will be given full protection when testifying under oath in front of an inquiring magistrate and in all subsequent stages of the criminal procedures”. Muscat had told parliament that the government would put up a “substantial and unprecedented reward” for information leading to a conviction. However, the journalist’s sons, who hit out angrily at the government after the car bomb, have said they would not bow to pressure to endorse the idea. “We are not interested in a criminal conviction only for the people in government who stood to gain from our mother’s murder to turn around and say that justice has been served,” they said. Investigators were continuing to chase down clues, with police analysing cigarette butts found near where the bomb was detonated, local media reported. 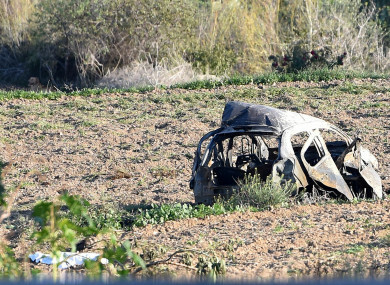 The butts were discovered where a “suspicious” vehicle was spotted, which could be that of the person who activated the explosive, sources close to the investigation told the Times of Malta. The vehicle was reportedly parked in the middle of a country road, away from nearby buildings. Forensic experts, aided by FBI agents and Dutch experts supporting the Maltese police, have combed the area. Tens of thousands of people are expected to march in Malta’s capital today in an effort to respond “as a united nation” to a barbaric act, civil society groups said. Newspapers in the European Union’s smallest state will also run a common front page Sunday under the slogan “the pen conquers fear”. Email “Malta offers €1 million euro reward over journalist's murder”. Feedback on “Malta offers €1 million euro reward over journalist's murder”.